Elastic at the hips and anterio closure with covered zipper and button. Double stitching at the points of greatest effort. 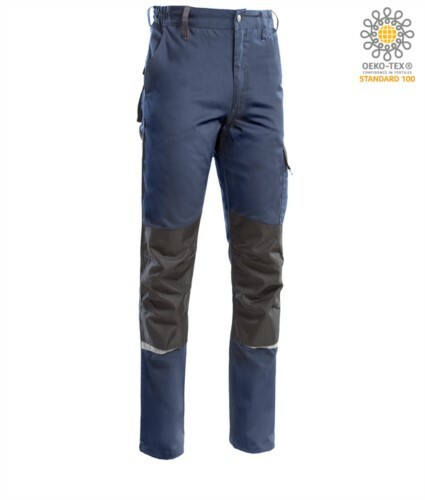 Profiles, flaps and internal contrast stitching, reflective piping below the knee and along the leg. Nylon ruler on the left, 2 front welt pockets, 2 back pockets closed with flap and velcro, 1 nylon ruler pocket on the right, 1 large pocket with bellows on the left, closed flap with velcro. Reinforced black nylon holder rack with opening for protection insert. Dear friend, I suggest you this article: Two-Tone Multi-Pocket Trousers; You can find it on the web at: https://www.castbolzonella.it/scheda.asp?content=.